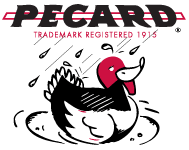 Pecard’s Suede Brush makes it easy to clean dry tanned leather and rough-out leather. The eraser removes stains and salt while the crepe wedge eliminates dirt worked free by the eraser. 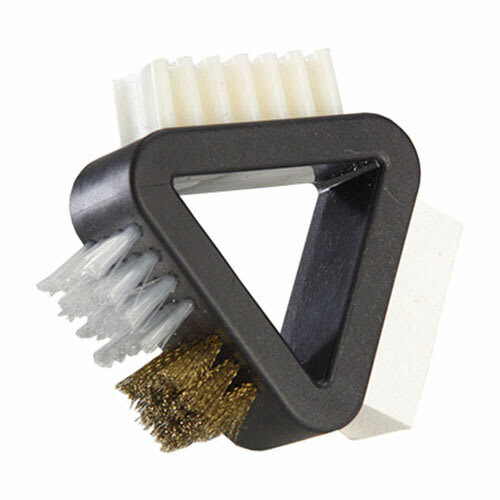 Use the nylon/brass bristle brush to lift the nap after cleaning. 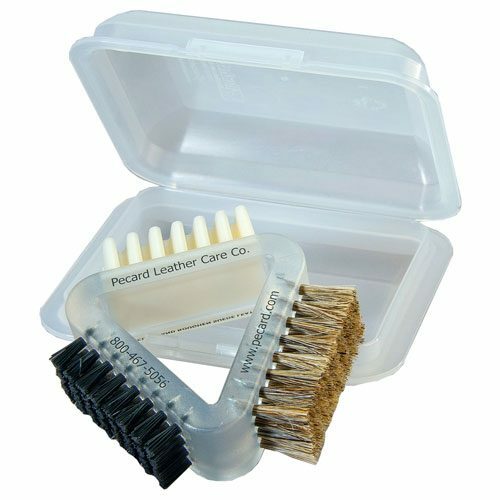 Brass Wire and Synthetic Bristles: Use synthetic bristles to brush stains out of leather. Brass wire bristles remove even the most tenacious dirt! Stain Eraser: Use a stain eraser to remove marks and shiny spots carefully. Clean your shoes with synthetic bristles afterward! Rubber Crepe: Brush the leather thoroughly with crepe. Crepe cleans leather fibers from dust and roughs them up evenly. Suede will look as good as new.